JellyBones: Guest blogger: Jennifer from Grits and Moxie! I've got quite the treat for you today: Jennifer from Grits and Moxie is guest posting! I've been following her rad blog for quite a while, and was super psyched when she said she would guest post! This is my first guest blogger, and I couldn't have asked for a cooler chick. Well, hi! I'm Jennifer and the lady behind the curtain over at the quirky lifestyle blog Grits And Moxie. This is one of my first guest posts so I'm beyond thrilled to be here at JellyBones...and I'm so happy that Trish invited me over! I noticed yesterday that the lovely ripe apples that our friends gifted us from a local farm needed to be eaten, cooked or something ASAP. Having never made an apple pie during the fall season...or ever, I decided to give it a try. See this? I made this! My first ever apple pie all from scratch! Well, I didn't make the crust, but it is still a pretty monumental experience in the Keene/Carrington household. If I say so m'self, it was delicious...and now I'm crowing about it from the rooftops! Preheat oven to 350 degrees F. Melt the butter in a saucepan. Stir in flour to form a paste. Add water, cinnamon, white sugar and brown sugar, and bring to a boil. Reduce temperature and let simmer. Place the uncooked bottom crust in your pan. Fill with apples, mounded slightly. Drizzle apples with maple syrup then gently pour the simmered liquid over them. Pour slowly so that it does not run off. Top with other crust and vent with small knife cuts or crust punch (which is what I used). Place the pie in oven directly on mid rack. Place empty sheet pan on lower rack to catch possible drips. Bake 35 to 45 minutes, until apples are soft. Let cool at least 1 hour before eating. The pie needs time to settle down and get all flavorful. You can top your slice o' pie with ice cream or a splash of heavy cream or just leave it plain. Regardless of how you do it, I hope you enjoy it! Plus your kitchen will smell delightfully sweet. If you have a moment and would like to stop by my blog then I would be oh-so-grateful. There are lots more recipes, pictures, adventures and fun stuff to be had. Oh, and Trish is guest posting over there right now. So, I hope to see you soon! Thanks again Trish...for everything. You're awesomesauce! Oooooooooh, I am a super sucker for pie. :) Thanks so much, Jennifer! Don't forget to check out my guest post over at Grits and Moxie, where you will find a cute and spooky Halloween craft. Well...... it's Jerdy's 30th bday today, so I'm off to make our apartment into a swanky cocktail hour party. Have a great weekend friends! Thanks so much for having me over Trish. 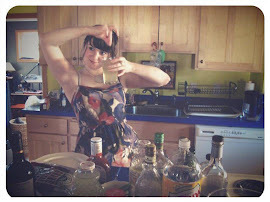 :) And thank you for your *excellent* guest post over at Grits And Moxie. I hope you'll guest post again soon! P.S. Trish, wow, awesome apple head tutorial! So creepy cool!!! however my post wasn't nearly as awesome as this delicious looking apple pie!! !